When my friend Mahangu first recommended me to Topher to write an essay for HeroPress, I could not believe his words. Quite confused I asked Topher, he repeated the same ‘Share your story on HeroPress’. It was unbelievable yet a beautiful sentence that left me stunned with pride. HeroPress has been a place where I occasionally read the stories of the WordPress heroes. Reading the inspiring stories, I have always found new energy for Work every day. Never thought my story would be worth this platform, I was overwhelmed to receive that message from Topher. I am NO Hero but just another full stack WordPress developer. More than that, I am a 24 years young web dude from Nepal. Nepal is a small country that lies in the foothills of the immense and sensational Himalayas. Moreover, it is the land of incredible natural beauty, adventure, and ancient wisdom and enlightenment. And this land has always inspired me to take tiny steps of truth towards the mountain-high peak. I could not agree much with Mahangu and Topher but I decided to share my story on this amazing platform. After all, I am not any exceptional but someone who wants to be a hero like (almost) everyone. Even though I was highly interested to computer from early childhood, I got one of my own only when I was in the 4th grade. As a curious child, I learned about technical aspects of computer from my senior brother and within a year or so on I started fixing the neighbors and friends computer. Since then I had a will to get things “right” as opposed to just getting things “working”. I vividly recall those days when I used to spend hours of my holiday playing Mario. Honestly, that’s still one of my favourite game. Back in those days, computer and internet were limited to few cyber cafes in town. I barely had any idea what they actually meant for except gaming. I thought they were established for the foreigners as they were mostly visited by the international tourists. After SLC examination (10th grade in Nepal), we have 3 months long vacation when students take extra classes such as bridge courses to prepare themselves for college. Since I was from the best school and was quite good at study I didn’t go for classes required for joining college. That was the time when I enrolled in a computer institute for hardware classes as I was quite interested to know how machine work. Thereafter, I joined college with Science faculty. The only motive behind joining the hardware class and choosing ‘Science’ was to prepare myself for mechanical engineering. But I could not do it. Physics, Chemistry barely made any sense to me and therefore started questioning its applicability in my day to day life. As a result, I failed formal education system. This is how I faced the first and last (till now) “failure” in my life, I dropped down engineering dream right there. Yet I no more worry, destiny had something other stored for me. Despite all, I had kept myself engaged with particular computer science, technology and web. I had somehow managed to learn basic HTML, CSS and designing stuff. I had made contacts with a number of people mostly senior to me who worked with programming, blogging. And one of them has a great role in shaping me as a ‘programmer’. Simultaneously, I read a lot of articles, followed people who mastered in programming which all supported my ‘new dream’ to become a ‘Programmer’. As suggested by a friend of mine, I created my first blog in 2010 using Blogger platform. Later, I came to know that WordPress was a better platform with more possibilities and finally switched to WordPress 3.2 after a recommendation from one of my seniors. To my surprise, it was more wonderful than what I actually heard. I loved WordPress. Thereafter, I started tweaking designs and other aspects. Since then, I haven’t looked back. 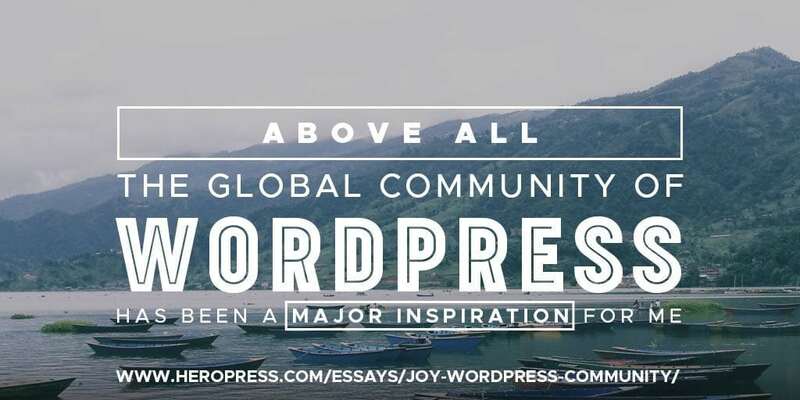 Above all, the global community of WordPress has been a major inspiration for me. I am always grateful to the community and millions of WordPress lovers for the generous resources. I have also been actively contributing to the WordPress translation. Greatly benefited by the works of others, I always wanted to give back to the community. The same instinct led me to the person I am today. Literally, volunteering for making WordPress platform for everyone has given me all the honors including this (feature on HeroPress). In 2014, among various WordPress possibilities, WooCommerce is the one which intrigued me from the very beginning. With the growing eCommerce market, I knew that it was going to be a excellent piece of software in the future because of its incredible features. Using the plugin and analyzing it from the user’s perspective, I made numerous enhancements on WooCommerce. I introduced Nepali currency symbol in WooCommerce version 2.2.3 which proved to be a milestone in developing eCommerce in my country Nepal. Additionally, I developed a Nepali payment gateway WooCommerce eSewa plugin without any incentive. The best thing about this whole thing is that, I got great help to deal with product platform from amazing folks like Mike Jolley, Claudio Sanches and James Koster. During the period, I learned so much about WooCommerce and coding in general. Since then, I have been reporting several bugs/issues and enhanced the plugin with 200+ pull requests on WooCommerce Github repository. Moreover I have also contributed to Storefront theme. Since I was already technical bent, I learned about Vagrant for development environment. My first instinct was to use Varying Vagrant vagrants (VVV). But as a developer, I wanted more flexibility over the stack I used. So I started looking for alternative and found PuPHPet. For those who don’t know, PuPHPet is – “a simple Vagrant/Puppet GUI”. In order to make it more robust, I started contributing to this project and have also introduced WP-CLI support. Afterward, I started automating my development approach. Since there was no good grunt package available to compile PO to MO files, I developed grunt-potomo. Desperate as I had dropped from college, I was quite doubtful if I would ever get any job. Web development was at its beginning stage (not established as a job), there was little hope but it proved to be an advantage for me. I got an opportunity to work as a web developer in RealTech Computer Institute which is the same institute where I had learnt hardware and programming. I worked on new and innovative eCommerce sites, finished numerous time sensitive projects, trained new developers in utilizing front-end frameworks like BootStrap, Foundation, jQuery etc. Later in 2015, I joined a growing team of ThemeGrill as Lead Plugin Developer. Together with ThemeGrill team, I have developed several WordPress plugins. To name a few, Social Icons, RestaurantPress, ThemeGrill Demo Importer are free WordPress plugins I have developed which are available in official WP plugin repository. Additionally, I have built several internal automated tools to improve overall customer support. I am also responsible for troubleshooting production issues, assisting WooCommerce, sales and performance monitoring. WordPress has made my life much easier! My hometown Pokhara is 6 to 8 hours of drive from the capital city Kathmandu. I along with few WordPress enthusiast friends used to travel all the way to Kathmandu just to attend WordCamp Kathmandu (formerly WordCamp Nepal). I was fascinated by the awesome presentations by developers and networking opportunities provided there. Within a year or so the number of WordPress lovers grew in Pokhara but we didn’t have any such event there yet. In love with WordPress, I thought of organizing WordPress people in Pokhara under common umbrella – WordPress Pokhara. By then, I created a Facebook group with some friends, who were involved in WordPress projects. We organized several WordPress meetups and talk about WordPress. The group has grown from 3-4 members to 1000 members in Facebook right now. Mostly I have seen students and professionals coming together and helping each other in projects. Since I am away from Pokhara, Yam B. chetri and team are involved to organize regular WordPress Pokhara meetups. Thanks to his helpful behaviour, we are rapidly growing. Since I switched to WordPress, I have been working with a motive to program a better solution for users which is surely a challenging task. So I am taking every small step to climb the cliff and still doing homework to reach the right destination. To be frank, I don’t want to explore how business work and I am not made for it. But I am quite confident on the fact that I am good at understanding public-facing issues to tackle with a right solution. This is just an ordinary story like yours as I said in the beginning. And I repeat that I am no hero yet my journey may be somehow different from yours. And thanks to HeroPress and WordPress. Let’s keep rising high as Everest! Together!! The post The Joy of Being with WordPress Community appeared first on HeroPress.